50% of Canada’s workforce is made up of women, but only 5% breakthrough to top leadership, according to Statistics Canada and Catalyst research on the Financial Post 500 CEOs. In the US, women represent 47% of the workforce yet just 4% breakthrough to become Fortune 500 CEO’s. 60% of all new Canadian businesses are started by women, yet less than 10% of women entrepreneurs breakthrough $1M revenue. These are not new statistics but rather the stubborn, harsh reality, for most women in business leadership. 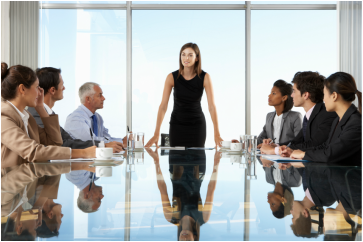 At the start of their careers, 82% of women aspire to be senior leaders yet half-way up the corporate ladder women have already begun to drop out and at the top, women vaporize. Simply hiring more women hasn’t fixed the problem. Ensuring higher education hasn’t helped either—women now represent 60% of university graduates and more than 60% of the professions—lawyers, accountants, doctors, are women. The result is a significant brain drain and huge loss of talent, especially considering that women make up half the population and majority of decision-making purchasing power. Career-building vs. Caregiving: The average age for women to have their first child is 28, so while their male colleagues focus on career-building from late 20’s to late 40’s, many women are juggling babies and childcare. Even single women say that they struggle with prioritizing personal relationships vs. career choices. Courage & Confidence: Women are considerably harder on themselves and self-critical compared to men. Men get promoted on their potential while women are promoted on their performance. Women typically understate their success and career ambition. Connections & Champions: The old boys club is entrenched and working well for men. Whereas women tend to have fewer connections and are typically hesitant to ask others to actively champion them. At Executive Passage, we love working with high potential women who want to breakthrough to leadership—we’ve been there, we get it! We provide coaching solutions that help women develop the courage and confidence, combined with powerful connections and champions to create their own ‘village of support’ to help them breakthrough to success.